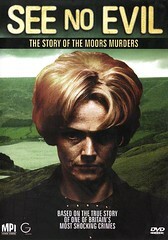 I rented ITV's See No Evil: The Story of The Moors Murders a few nights ago. Like most Morrissey apostles, I came across this horror from The Smiths song "Suffer Little Children", off their self-titled debut album. See No Evil: The Story of The Moors Murders is about the infamous Moors Murders case in Manchester. The case involves serial killer couples, Ian Brady and Myra Hindley, who killed a total of five children between 1963-1965. The ITV movie version is in two parts and largely centers around the Brady & Hindley's relationships with brother-in-law, David Smith, and his wife, Maureen Hindley. The movie tastefully does not show any actual murder, and most references were made after-the-fact through investigations and their eventual capture and trial in the second part of the movie. I will have admit, the movie should have long ended with the imprisonment of the couple, instead it dragged on with Maureen's story. Anyway, the song, "Suffer Little Children" (originally titled "Over the Moor"), is the first song to be written by Morrissey and guitarist, Johnny Marr. Suffer little children, and forbid them not to come unto me: for of such is the kingdom of heaven. Johnny Rogan, writer of Morrissey & Marr: The Severed Alliance and The Smiths: The Visual Documentary, suggested that this song was "too personal for regular public exposure" pointing to the fact that "Suffer Little Children" was only performed live once. As for recorded version of this song, the one that most people are familiar with is John Porter's version from The Smiths' debut album. What most people don't know was that the original album was to be titled The Hand that Rocks the Cradle, by producer Troy Tate. The original Troy Tate sessions found its way, in parts or in whole, on many Smiths bootlegs, including The Cradle Snatchers, The Hand that Rocks the Cradle (LP), A Nice Bit of Meat, and the horribly named, The Troy Hands that Rocks the Cradle. Apparently there is another version of the Troy Tate sessions, often called "rare remixes" that's found its way on the internet. This one is rather obvious. At the end of the TATE2 mix, the outro guitar is accompanied by cymbal, but at the end of the TATE1 version, there is no cymbal. Instead the song segues into the piano part that was later used by the band in "Asleep". The woman giggling or crying at the 4:00 mark is present in the TATE1 mix, and absent in the other one. Also, the "you might sleep but you will never dream" line differs. Another slight but noticeable difference is the presence of an echoey 'tock' sound at the very beginning of the TATE2 mix. The same sound can be heard at the very beginning of the TATE2 mix of "Wonderful Woman", but in a lower pitch. That's it for now. Read more about Morrissey on W♥M.